While penny round metal mosaics are not new to the builder depot, but now buying direct from the factory we are able to offer the lowest price in the industry plus – Free Shipping. As we are in the ecommerce Carrara marble and natural stone market we often buy product from our competitors. We pride ourselves on operating our business with the lowest possible cost. No frills marketing campaigns and allocating all resources to quality and price. Essentially gambling on word of mouth and referrals being the major driving force behind our business. This strategy has worked incredibly well. Given the fact we buy full containers direct from Italy we wonder how is it possible that our competitors offer the same or even lower prices. So like any consumer (or researcher in this case) we order samples to find out. This is our findings. 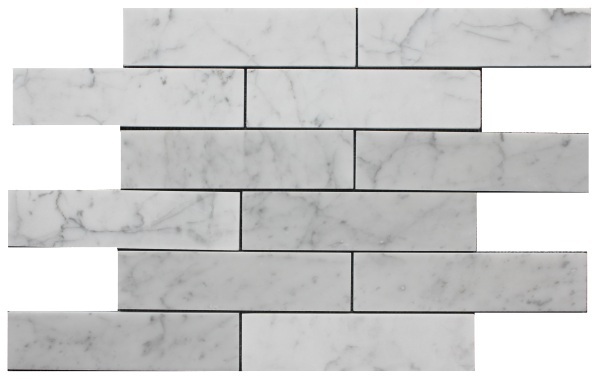 You cannot beat our prices genuine Italian marble subway tiles sold from $7SF-$8SF. However this is the way our prices are beaten or matched. So this explains how competitor #1 is able to sell close to our pricing, just make a lower quality product (that simple). Our factory can produce this 1/4″ thick tile and we could then sell it for $6.00SF. But we would prefer to keep our standards high. Thicker tiles, less breakage during shipping and less damage during the cutting process. 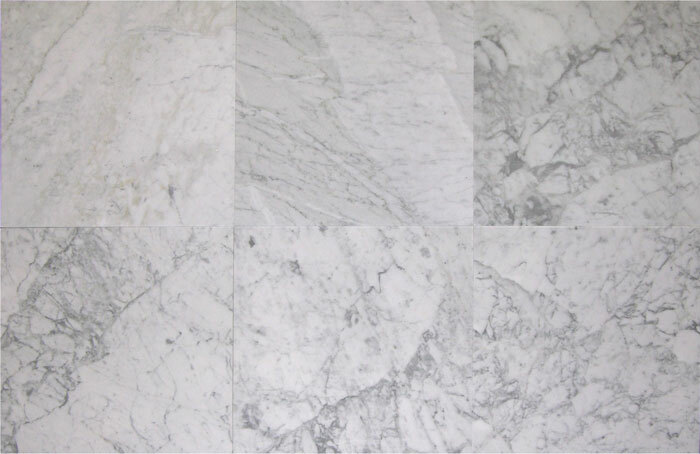 Our Carrara Venato is $7.00SF and Carrara Bianco is $7.95SF we prefer to not to compromise quality to make an extra $1 or $2SF. Number 2. Or the second option to compete against us. “Buy from Turkey and Call it Carrara”. You can see the lack of veining and if you could see the tile it glitters or has a crystal effect to it. Turkish white marble is cheap and by cheap I mean USD $16m2. That (dividing by 10.76) equates to $1.48SF this is the cost price from Turkey. This means that from Turkey you can get white slightly glittery marble with some gray tones for $1.48SF. So it is pretty easy to see why this product can be sold for $6.95SF (True Italian Carrara – as in the stuff from Carrara Italy) is more than 2x the cost. 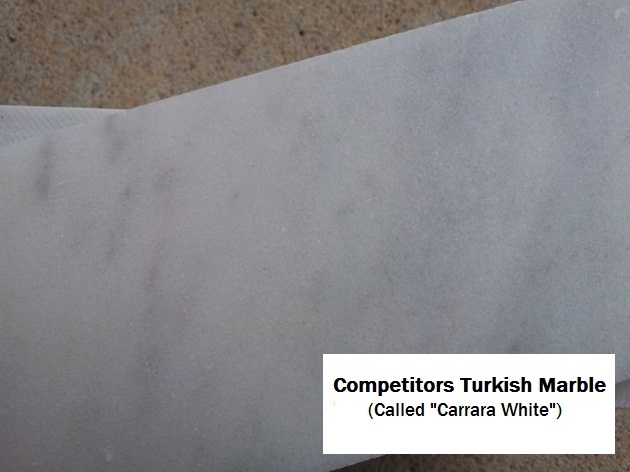 Having a white marble, then calling it “Turkish White” or “Carrara White” or any other name and selling it for $6.95SF is far more profitable than http://www.thebuilderdepot.com importing Italian Carrara and selling it for $7.50SF. Conclusion. For us we really on quality and selling in collections – we are proud of our business. We know we cannot compete against someone on Ebay importing a container of Turkish tiles and selling them as Carrara for $6SF. That is not our market. We aim for the highest quality and keep our costs as low as possible to deliver an exceptional product at exceptional prices. We aim to sell complete bathrooms with matching collections of Italian marble in Carrara or Calacatta. Thank you for taking the time to read my competitor analysis – I will in 6 months order more samples and go over the process again. Making sure our customers get the best quality and best deal. Any questions please email me david@thebuilderdepot.com or call 800-308-9359. PS – We did not mention any competitors names – we do not want to waste money on a lawsuit (we do not want to add any unnecessary costs to our products) – regardless of what we say is the truth – people love to sue. 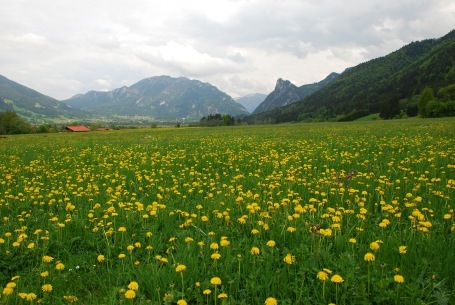 The first day of spring is also called the Vernal Equinox. The days and nights are exactly the same length. Following on from the last post and watching Bravo Networks TV show and looking through some Home Improvement magazines it is quite evident that there is an increasing popularity to larger format subway tiles. Carrara 6×12″, Carrara 12×24″ and then subway tiles that are not traditional rectangular shapes either, like 3×8″ and 2×8″. I had the factory in Italy put together some 2×8″ tiles and email me a picture. They are really, really pretty and different. This would look incredible in a brick format, but even better in a herringbone format on the floor. Either way the Carrara Bianco 3×8″ honed and polished will be here in 10 days. Then the 2×8″ will be here (I know it states fall) I hope around July/August. It will be interesting to see how popular these sizes truly are. Any questions with regards to the 3×8″ or a quote please email me david@thebuilderdepot.com or call 800-308-9359 (mention this blog and you will receive an additional 5% off the price of the 3×8″ tile – offer closes April 1st 2012). So I finished work early today as the my Elementary schooler had early release today (I wish it was late start and normal release – I get her to school at 7:10am). While waiting for the school bus to show up around 12pm instead of the usual 2:30pm I watched a re-run of “Interior Therapy with Jeff Lewis – Episode #1 Almost Perfect”. 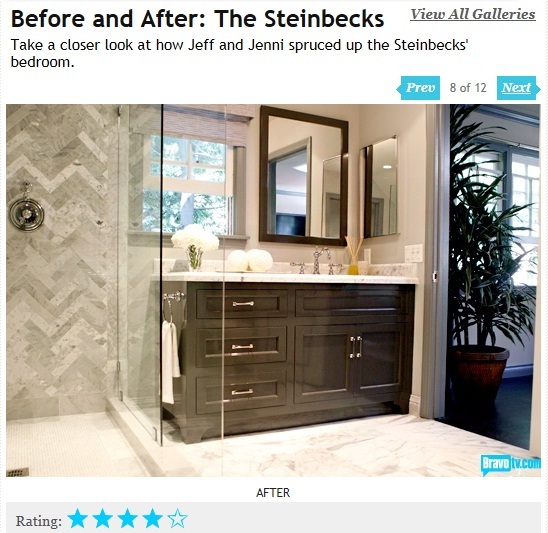 Being in the home improvement/remodeling business I like to watch new styles and see what products are being promoted. Especially since our products were actually on the DIY network on a show call “I hate my Bath”. The bathroom (though they did not say during the show) is a 18×18″ Calacatta polished tile (we sell 12×12″ Calacatta and 6×12″ Calacatta for just $14.95SF – which is a lot cheaper than the product they used in this show.) our Calacatta 12×12″ and 6×12″ is actually Calacatta Borghini. So we have the best possible Calacatta gold marble – ours is available in honed and polished – okay enough promoting our Calacatta Gold. The shower was the interesting part. They went for a Carrara Herringbone format, but not a mosaic and not Calacatta which they used on the floor. They used a 12×12″ tile and cut it into 2″ x 12″ strips and then installed it. It looks fantastic. It takes 6-9 months for us to introduce new products from Italy and it just so happens at the end of March we have 3×8″ subway tile arriving, we also along with JeffLewis recognize that long plank field subway tiles look awesome installed on the floor or wall in a Herringbone format. So we just feel that it is cool that we have moved in a direction of longer thinner planked marble subway tiles just at the time when we are seeing it more on TV and magazines. The advantage with ours, the 3×8″ Carrara Bianco honed and Carrara Bianco 3×8″ polished only costs $8.50SF and they are already cut with a micro-beveled. The time, cost and waste savings of not having to cut 12×12″ is incredible. So looking to recreate this bathroom or just looking to create a long plank Herringbone masterpiece of your own – we have the solution on March 25th. Towards the end of 2012 we will have 4×12″ and some other formats – so stay tuned. For more information please email david@thebuilderdepot.com or call 800-308-9359. Carrara Bianco 18×18″ imported from Italy is a stunning addition to the Carrara Bianco collection. Large format tiles have become increasingly popular as consumers seek fewer grout lines creating an overall less busy appearance. 18×18″ is available in both honed and polished to complement the collection of honed and polished mosaics, field tiles and trims that are available from the Bianco Carrara Collection. For more information a sample or a quote please email sales@thebuilderdepot.com or call 800-308-9359.